Doctors could soon be able to diagnose diarrhoea, one of the world's biggest killers, much more quickly. 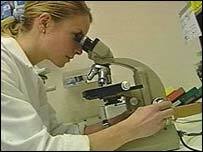 British scientists have developed a test which they say can identify the bugs that cause diarrhoea in one hour. At present, doctors can wait days for the results of laboratory tests before they can make a firm diagnosis. Researchers at universities in Bristol say their test could help speed up that process dramatically, saving lives and money. According to the World Health Organization, diarrhoea claims the lives of over two million people each year. Most of these deaths are in developing countries. Diarrhoea as a result of an infection can last a few days or weeks. In severe cases, it can be life threatening because of the loss of fluid. Infants, young children, people who are malnourished and those with weak immune systems are most at risk. Diarrhoea can also be a problem for people living in developed countries. There are 15,000 cases of clostridium difficile infection, one of the most common causes of diarrhoea, in England and Wales each year. This test, which was developed by researchers at the University of Bristol and the University of the West of England, analyses the odour from stools to identify what bacteria may be causing the diarrhoea. "It has long been known that stools have distinctive and different odours if there is an infection," said Professor Norman Ratcliffe of the University of the West of England, and one of those involved in developing the test. "What we have done is to take this knowledge a step further by analysing the odour to see if precise chemical fingerprints can be established. "Put simply, the odours or 'volatiles', from normal, bacteria and viral stools differ significantly in their chemical composition. "By using portable instruments we can identify which volatiles are found in a stool sample in less than an hour of the sample collection being made and use this information to make a rapid diagnosis." Dr Chris Probert, a consultant physician at Bristol Royal Infirmary, said the test could benefit UK hospitals. "Hospital wards in the UK have sometimes had to close because of the fast spread of viruses that are not detected early enough for infected patients to be isolated. "This causes enormous strain on hospital resources and of course can be very expensive." Professor Ratcliffe added: "The test has the potential to reduce mortality and unnecessary suffering and, crucially, the spread of infection."